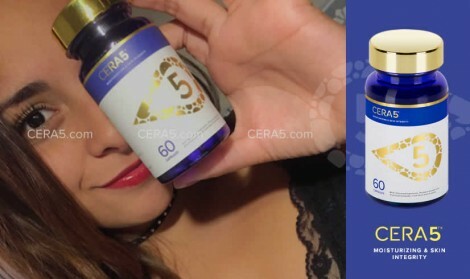 CERA5™ is a powerful skin-hydration promoting beauty supplement that is formulated to provide and endogenous(body self-producing) NATURAL MOISTURIZER for the whole body and work as an INVISIBLE SHIELD for our skin, protecting it from the daily onslaught of free radicals. Dry skin tends to feel unnatural tight & stretched, flaky in spots and appear dull, especially on the hands, cheeks and around the eyes. Very dry skin will lack elasticity and accentuates fine lines and wrinkles, making you look much older. For some, it will even itch, burn and crack! Your skin comprises of 40% ceramides. It is the structure within your cells that allows you to retain moisture. The stronger your cells are, the more moisture they can hold; making your skin feel and look smoother, softer and more supple. Hydrate your cells and allow entire skin layer to retain more moisture naturally from the inside out. Hydrate your skin from within, promote smooth and soft skin. Enhance long term moisturization and protect the skin from external elements. A revolutionary approach to anti-aging supplement. Strengthens your cells and allows your skin to retain more moisture naturally. 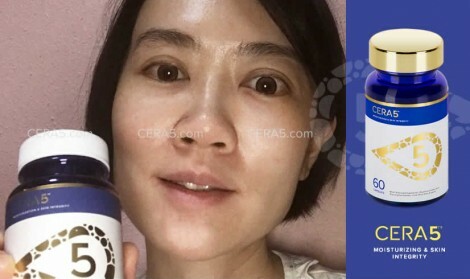 CERA5™ works internally to hydrate your skin from the inside out. This allows you to hydrate every inch of your skin in an instance, keeping your face and body soft and supple. In addition to that, it helps to keep your general health and bodily functions at peak performance levels. CERA5™ provides your skin with an extra layer of protection shield, reinforcing your skin barrier, defending it from the harsh surrounding environment. Your skin will become tougher against wear and tear, and able to withstand the daily onslaught of chemicals permeating home, workplace etc. CERA5™’s Ceramides are highly effective in the prevention of and treatment of mild to severe skin dryness. It contains rice-derived ceramides that, through oral ingestion, are proven to be safe and a superior beautifying agent in multiple clinical studies. • Results indicated a global improvement of cutaneous hydration. 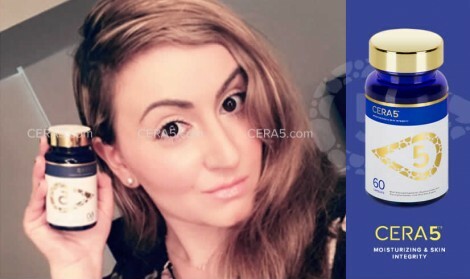 • 92% of women in CERA5™ Ceramides group displayed increased degree of hydration. 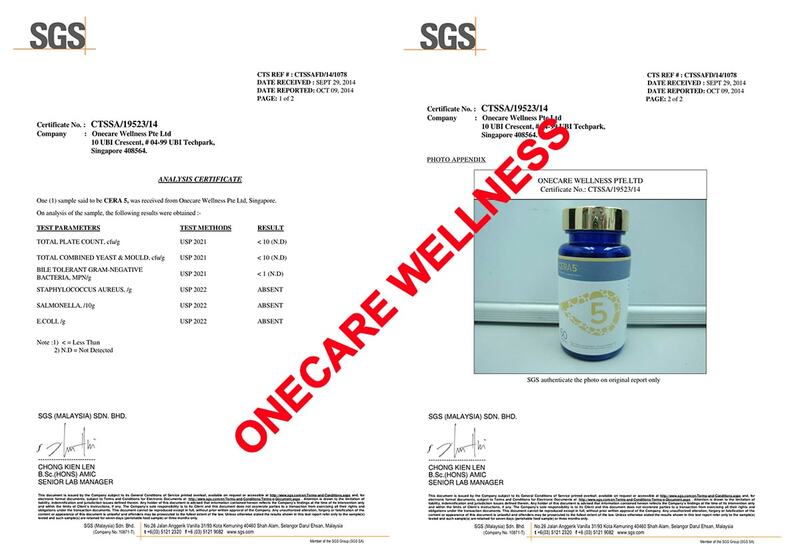 • Clinical evaluation: cutaneous dryness and redness were significantly improved in CERA5™ group. • Hydration measurement: CERA5™ significantly increases the hydration degree on face and limbs, almost 100% higher than that of placebo. • Self-assessment: All of the volunteers perceived CERA5™ as being much more effective throughout the entire clinical trial. There are hundreds of cosmetics containing a varying degree of ceramides in the market, but all of them are for external application. Applying them on the outer surface of your skin is not enough as the skin is designed to keep things out. Therefore they are poorly absorbed by your skin, especially aging skin which are prone to poor absorption as its lipid balance is damaged from age. That’s why CERA5™ is uniquely designed to work from the inside, delivering both internal and external results. The ceramides contained in CERA5™ is an active compound derived from rice. Other plant-based ceramides are hard to be absorbed or retained in the blood. They are also highly unstable and tend to become rancid quickly. 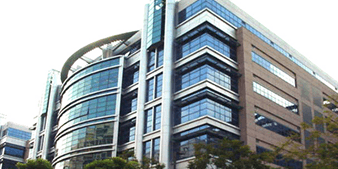 Our supplier from Japan took the lead in resolving this impasse by investing in a new ceramides extracting technology. For years, the Japanese have been researching a way for the body to improve skin barriers by trapping and increasing the moisture content of the skin. 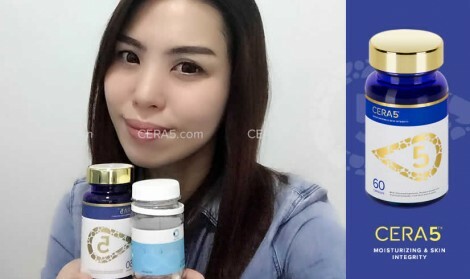 The discovery of CERA5™ marks a successful milestone, as with this patented bioenhanced preparation produces highly superior ceramides extracted purely from rice(instead of Konnyaku potato or wheat), making it the most stable and effective form of ceramide of the skin. 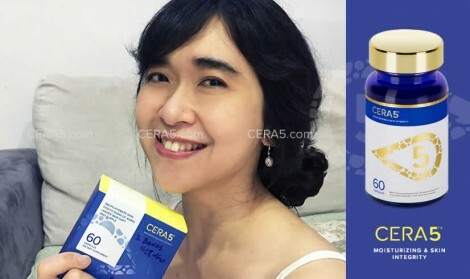 The moisturizing effects of CERA5™’s rice-based ceramides, when compared to other commercially available ceramides, demonstrated superior moisturizing effect that surpases the rest with a moisturizing ration of 35%. How soon can I see the wonderful effects? Start seeing results in just one week, then continue to look younger with each week of usage. Optimal results are seen after about 3 months of usage. Overall skin health is visibly improved. With long-term usage, you can defy your age and look at least 10 years younger with tell-tale signs of aging elimited. 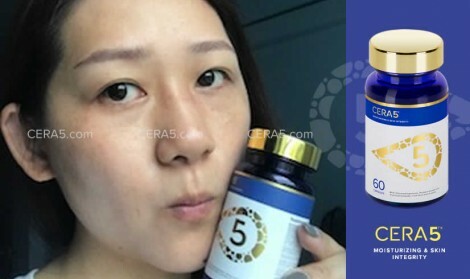 The effects of CERA5™ typically last a month or more, depending on your lifestyle choices, such as: sun exposure, diet, and stress. This is because ceramides stored in the body are continually used over time. 83% of users agreed that the skin of their whole body looks revitalised after taking CERA5™. However, each individual is different and results will vary based on one’s lifestyle and diet. Generally, you should notice improvement in skin suppleness and radiance within the 1st-3rd weeks. By the 6th-8th week, you should notice that your skin has become firmer. The key to long-term results is long-term usage. So make CERA5™ a simple part of your daily routine! 80% of the users noticed softer, smoother and more radiant skin within a short period of taking CERA5™. 78% of the users noticed higher level of skin moisture retention all over their body and eradication of dry skin after only 2 weeks of usage. 80% of the users noticed restoration of the natural skin barrier as their skin appear healthier than before. 80% of the users reported a noticeable reduction of itch and redness after 3 weeks of usage. 90% of the users noticed improvement of skin tone, from pale yellowish tone to pinkish complexion. 85% of the users noticed reduction of fine lines and wrinkles, visible improvement of the structural integrity of the skin. CERA5™ contains groundbreaking ingredients that are derived from 100% natural sources through cutting edge extraction technology. These ingredients are validated by clinical studies to confer skin protection and age-defying properties. Level of ceramides declines with age, while factors such as stress, poor nutrition, and environmental contamination may accelerate the process. Ceramides maintain skin hydration at cellular level, boosting the renewal process from inside and out, keeping skin healthy and young. CERA5™ allows your skin to continue to do this at optimum level even as you age. 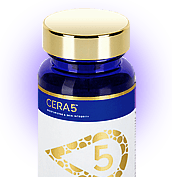 Cera-5 improves the cells you see as well as those you don’t see within your body. Cracked and damaged skin is moisturized. Wrinkles and sun-damaged areas fill out and look fresh. Within, cells throughout your body rebuild, rejuvenating you from the inside out. Gorgeous, youthful skin also requires vitamins, the building blocks of health. 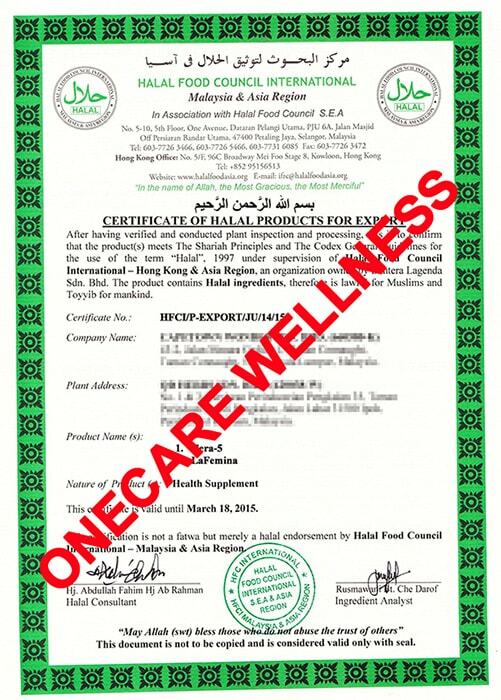 The Onecare Wellness formula Combines Ceramide with the most powerful antioxidants AstaREAL Astaxanthin, R-Lipoic Acid and Lychee Seed Extract which are essential for healthy, youthful and beautiful skin. Although CERA5™ and Ag-Factor™ have similar benefits, each targets your skin with a completely different approach. 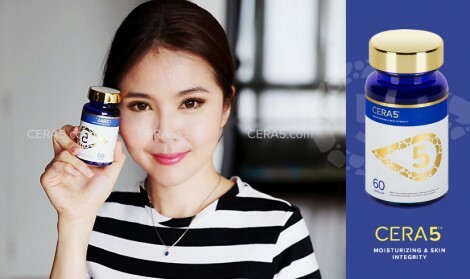 CERA5™ mainly boost and lock moisture within the skin. 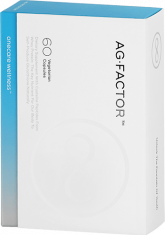 While Ag-Factor™ works from the liver to purify your blood, enabling your body to produce glutathione while balancing your hormones. Hydrates your skin from the inside out, fill in wrinkles, smooth and soften your skin, strengthen your cells for obvious and longer lasting results. 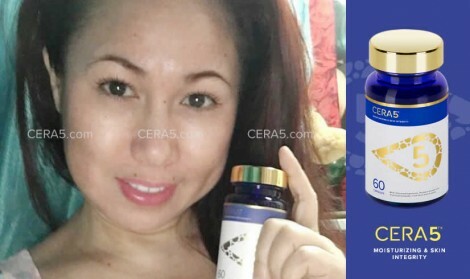 Works naturally to enable your body to work more intelligently to produce its own glutathione and collagen. Brightens your skin to a radiant glow, leaving it smoother and firmer. 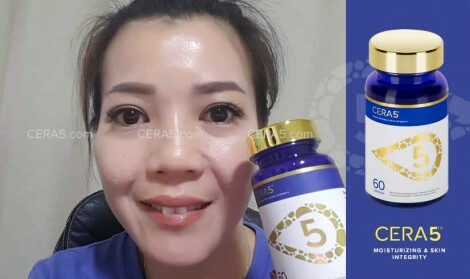 CERA5™ repairs your skin by supplying your body with the much-needed building blocks to rebuild your skin’s natural defenses; helping you to prevent age-related skin problems such as atopic dermatitis and weakened skin that is prone to infections. Your skin is your first and most important line of defense against microbial infection as it covers and protect your sensitive internal organs from harmful toxins and bacteria. Studies discovered that old, damaged or diseased skin has far fewer ceramides present in them. 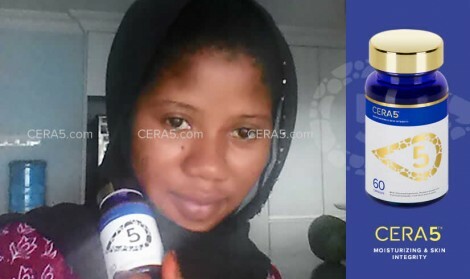 Scientists have also found that supplementation is proven to be an effective method of fighting common skin diseases such as eczema and psoriasis..